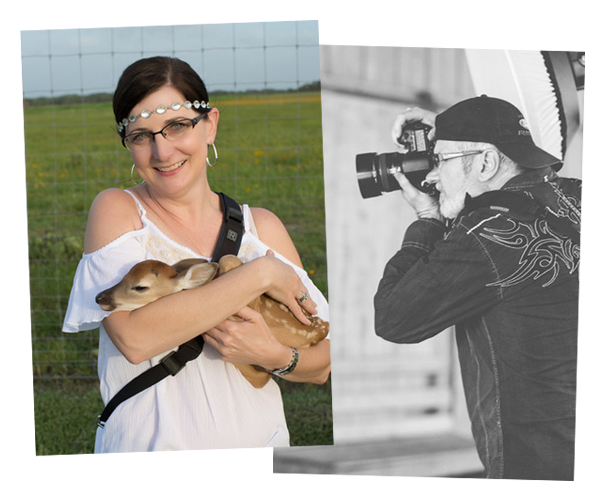 We are Tammie & Dennis Albrecht & we LOVE photographing YOU! Whether it be documenting your baby bump, fresh newborn baby, your child's first cake smash, family, or one of the most important days of your life…YOUR wedding day. We are based in Victoria, but enjoy traveling to new and exciting destinations. We are both very passionate about what we do and are very blessed that we can work side by side doing something we love. We like finding unique places for our couples and finding fresh new ways to photograph them…using different angles, unique lighting and classic photography styles. Our imagery is based on elements of classic photography, not "photoshopped" to the extremes! Our approach to each session is fresh and new. We make our couples feel comfortable in front of the lens. Our style of posing is natural... never forcing a pose, but letting you fall into a pose with our guidance. Our approach is simple...we let you be YOU. YOU MIGHT LIKE TO KNOW ABOUT US! A promotional video we created in 2014 to show our interaction with those individuals we photograph. We coordinated with other wedding vendors that we enjoy working with to decorate our studio, provide hair and makeup for our models, provide some delicious cakes, and cinematically document the entire event. Special thanks to our wonderful clients for modeling for us. Well hello there AND thank you for stopping by to take a look at our work. We are honored that you have considered us to be a part of your precious moments, captured in time...the smiles, laughs and giggles… YOU make our job amazing-sauce!!! !